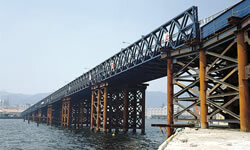 The KD-Bridge is a truss-structural bridge. 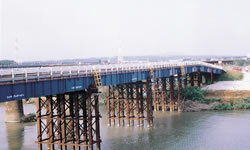 Its merits lie in the Simple and Swift erection of temporary diversion bridge to service the closure of the main-bridge due to upgrading and repair or disaster relief works. 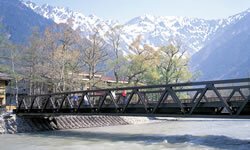 The Pre-Girder Bridge is a simple sheet beam bridge. 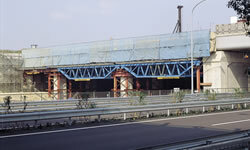 It has few Splice locations, which speeds up the erection and dismantling works. 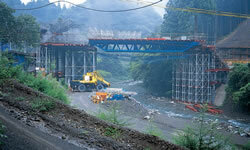 It is used as temporary diversion bridge to service the closure of the main-bridge due to upgrading and repair or disaster-relief works. 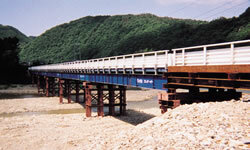 It can also be adapted as working platform within worksites. Copyright © HIROSE Singapore Pte Ltd. All rights reserved.